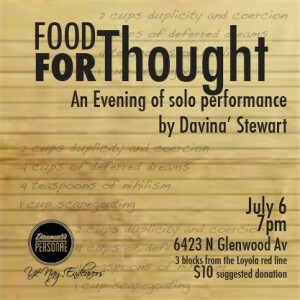 Writer and performance artist Davina’ Stewart brings her counter-narrative performance work to Artistic Director Lindsay Hopkins’ Dramatis Personae space this summer, on July 6. Food for Thought, a collection of several performance works, is Stewart’s challenge to contemporary audiences to re-think, and hopefully change, current socio-political realities in the United States. Through the examination and investigation of internalized and institutionalized racism, viewers will co-create and envision new possibilities during the performance. Tickets are on sale at Brown Paper Tickets, and can be purchased by clicking here. For more information on the artists, click here.